NETWORK FINALS: There were no changes from the preliminary ratings for Monday’s broadcast shows. 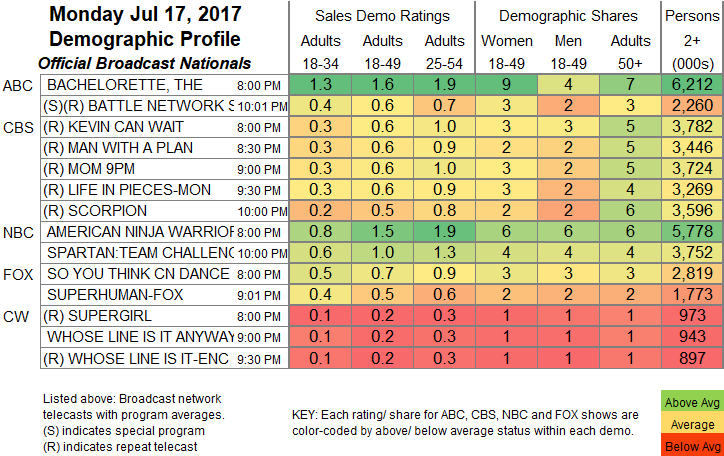 CABLE HIGHLIGHTS: AMC’s LOADED had a disastrous launch at 0.08, losing most of its PREACHER lead-in, as that show went up 0.02 to 0.42. On ID, THE CORONER premiered at 0.28, and the MURDER CALLS finale was down 0.06 to 0.27. VH1 occupied the not-iron throne of Monday cable, with LOVE & HIP-HOP up 0.04 to 1.37, BASKETBALL WIVES down 0.02 to 1.05, and DAYTIME DIVAS up 0.05 to 0.49. USA’s WWE telecast was at 1.10/1.08/1.03, compared to last week’s 1.00/0.97/0.95. On MTV, a new cycle of TEEN MOM was at 0.84 (compared to 0.56 for last week’s Reunion special), and TEEN MUM was steady at 0.36, with another episode at 0.29. On Bravo, REAL HOUSEWIVES OF ORANGE COUNTY climbed 0.03 to 0.63, SOUTHERN CHARM lost 0.04 to 0.46, and SWEET HOME OKLAHOMA was at 0.24/0.19, compared to last week’s 0.26/0.20. On Discovery, STREET OUTLAWS ticked down to 0.47, and VEGAS RAT RODS held at 0.31. On HGTV, HOUSE HUNTERS INTL rose 0.03 to 0.38, HOUSE HUNTERS dropped 0.06 to 0.32, and TINY PARADISE was at 0.32/0.30, compared to last week’s 0.36/0.33. 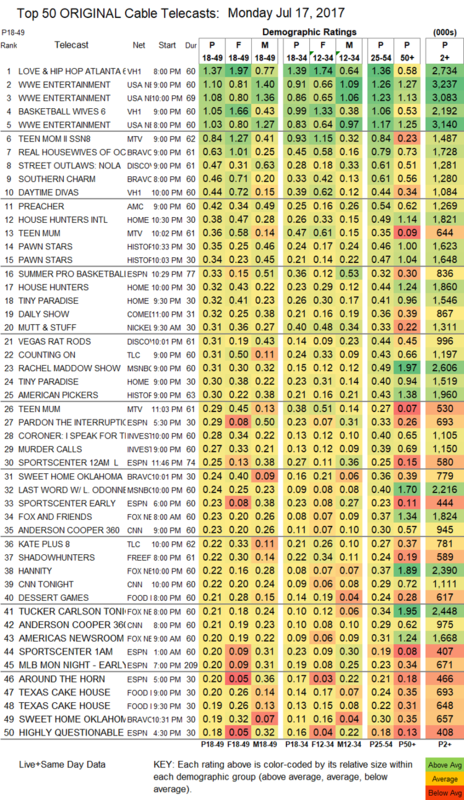 On History, PAWN STARS was at 0.35/0.34, compared to 0.30/0.27, and AMERICAN PICKERS ticked down to 0.30. ESPN’s SUMMER NBA game was at 0.33. TLC’s COUNTING ON fell 0.05 to 0.31, and KATE PLUS 8 was down 0.06 to 0.22. On Freeform, SHADOWHUNTERS gained 0.03 to 0.22, and STITCHERS ticked up to 0.12. On Food Network, DESSERT GAMES lost 0.03 to 0.21, and TEXAS CAKE HOUSE was at 0.20/0.19, compared to 0.21/0.20. TNT’s WILL was at 0.16, which was steady with last week’s 9PM episode (it fell to 0.09 at 10PM).